Yoga is for Every Body, regardless of your shape, size, or flexibility. It is our intention to host classes that can fit every yogi style—from beginners to seasoned practitioners. Whether you prefer a more meditative practice, or an upbeat calorie burner, we have a class for you. Push your fitness goals while sculpting, slimming and stretching your body. We offer a flavor of Barre infused with ballet, mat pilates, and plyometric functional exercises. 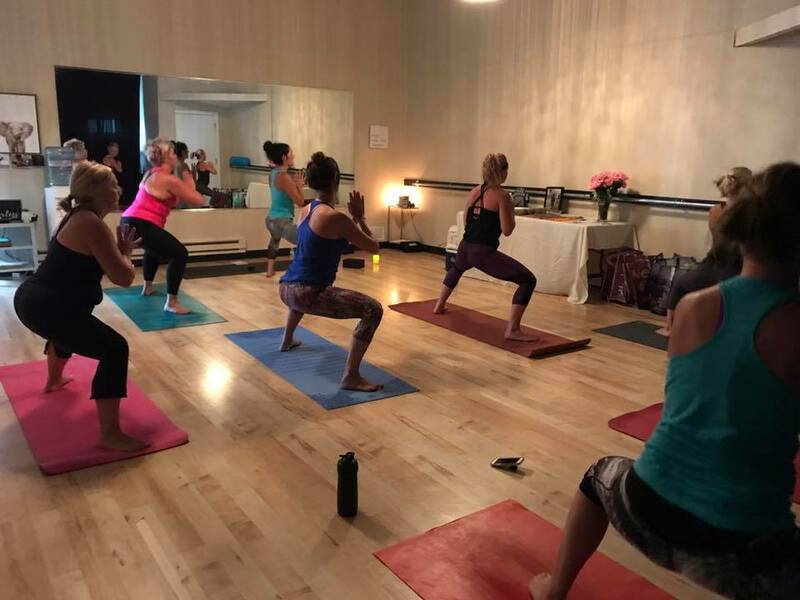 Focusing more on the fitness side rather than dance, our classes include interval training, a balance of cardio & strength building, and total body sculpting. Sarah is always cooking up something new to keep your workout fresh, while offering challenges to all levels. Empower your whole self by building strength from within. Come embrace the shake with us! Flowing movements for beginners and advanced yogi’s, this class helps you focus on linking each posture to your breath. Get to know basic poses and terminology while challenging your mind and body. Intended to build your fire, this class is suggested for an intermediate yogi. It concentrates on proper posture and flow through yoga sequences at a faster rate, with plenty of repetitions, pulsing, and core work. You will sweat your stress away by connecting breathing to steady movements in this high-energy class. Yin poses apply moderate stress to the connective tissues of the body—the tendons, fascia and ligaments—with the aim of increasing circulation in the joints and improving flexibility. Practicing 5-8 postures per class allows you to hold poses longer and cultivate an awareness of inner silence. Hatha translates to Sun-Moon yoga, and strives to bring balance to opposing parts of the body while holding postures for a longer duration. 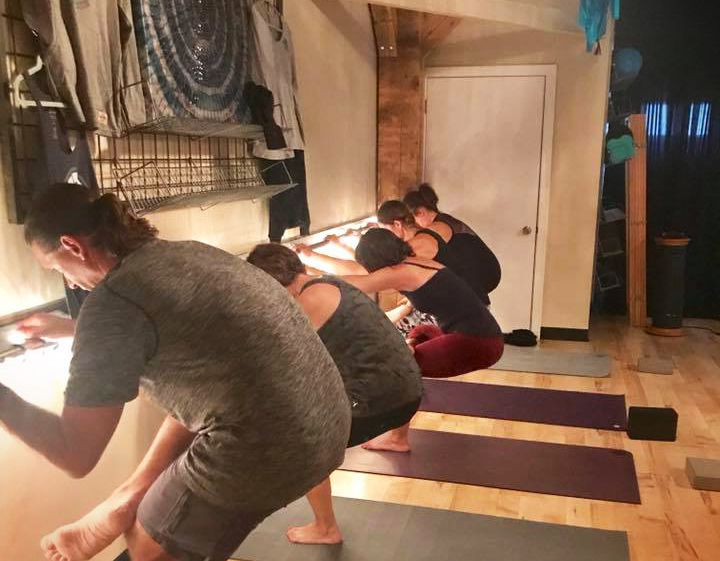 Utilizing poses to increase flexibility, strength, and awareness of breath, Hatha is great for students looking to practice a more gentle style of yoga. Many of our Hatha classes incorporate guided meditation and yoga props. 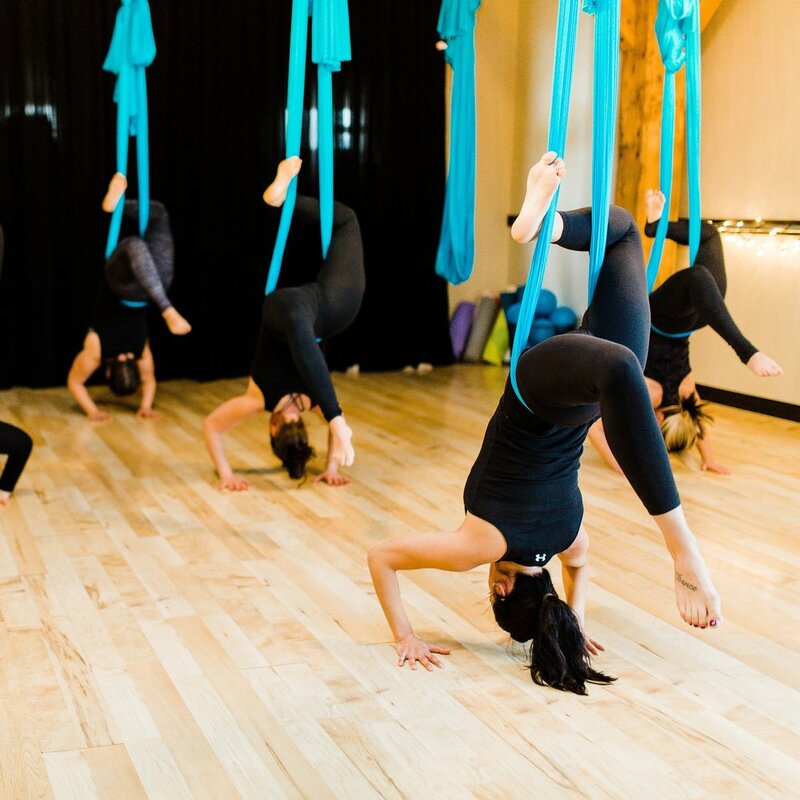 Want to experience the incredible benefits of Aerial Yoga, but not quite ready to sweat your way through a Power class? Mixed Level Aerial offers a slower paced aerial practice to become comfortable in the silks, understand the terminology, and master the transition of poses. *You must complete an Aerial Intro course to attend this class.